I’ve long been a fan of Google Inbox, the alternative interface to Gmail. Inbox recently announced that 10% of email replies using Google Inbox are now written by the built-in SmartReply feature – probably the biggest current implementation of a robot assistant. The feature has just been released to the web version of Inbox. I’ve been using the latest version of Microsoft Office, 2016, at home for about 6 months, and have recently installed it on my work laptop. The main differences between the previous version of Office and 2016 are the collaborative working features – which trail far behind the Google Docs equivalent – and only work on OneDrive or Office 365 – and yet another function in the toolbar called “Tell Me”. You want to leave a comment? Which of these dozen features would you like to use to leave a comment? Tell Me highlights the philosophy between Microsoft and Google… Google’s Inbox provide pre-written answers to emails in Inbox – one click writes the email and sends it. 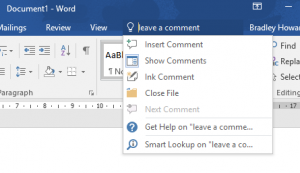 With Microsoft, you still need to ask the questions such as “Leave a comment”, and you’re presented with a list of functions rather than doing it… i.e. you are still some way from achieving the functionality. 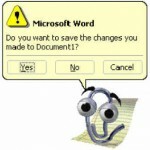 I think that Microsoft’s strategy is that Tell Me is their answer to Gartner’s robot assistant, but it’s well behind. It’s the Microsoft Office Paper Clip in a 2016 design. Google’s Inbox is the Gartner robot assistant. Microsoft has a 95% market share of office productivity software, so in order for Gartner’s prediction to come true, Microsoft Office must improve significantly, and quickly, for 20% of business content to be authored by machines.